My first introduction to Borderlands was years before it became the phenomenon it is today. I remember the old trailers for the game. Pre cel-shading, pre wub wub. 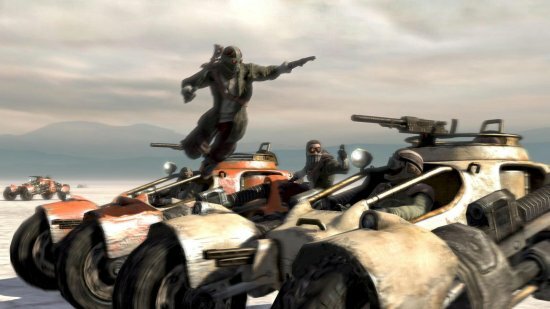 The Borderlands I saw appeared to be a straightforward game of unforgiving wastelands, ruthless bandits, and legendary alien technology. This Borderlands seemed to take itself too seriously, with little to show for its strange, clichéd efforts and odd humor. I lost interest in the title for the most part and the game dropped off my radar. Then came PAX '09. Desperate for food and lured by the promise of pizza and a friends interest in their panel, I found a seat at the Gearbox Panel. The attendance was so sparse we found ourselves with a pizza each. As the gearbox team began to speak I found myself looking at that same old trailer I'd dismissed before. They spoke for some time about the game they started to make. As they went on, I was surprised to hear them talk about their own disappointments. They received unenthusiastic response from the press and public, even from publishers. The game was missing something. So the team at gearbox did something unorthodox. They scrapped the game as it stood. They went back and changed the look and feel of the game. Replacing the realistic, gritty look with the cel-shaded graphics we see today. The humor they had tried for at the outset suddenly fit. They were able to take it further, finding new elements they could expand on with the freedom their now more overtly lunatic realm gave them. More than a hilarious and solid game, I saw a team of developers that loved what they were doing. To take a project they had slaved over for years and remake into something entirely different was more than bold. It was insane. But to see their faces light up as they talked about what their vision had become, to hear them squee when they found some other little tidbit to show off. I think that is what sold me on Borderlands. It's a shame that when we talk about the series today, this crucial step in the games development is so often glossed over or forgotten. It shows in every inch of Borderlands and even more so in its incredible sequel. Since its release I have seen countless posts on Reddit from players that found specific, personal moments within Borderlands 2. This is often attributed to the writers skill and attention to detail. Its more than that, in my opinion, though their decision to take Anthony Burch on board is yet another spot of brilliance. The ability to find the humanity and depth in what on the surface is an insane, blood and mutant filled treasure hunt comes from that same heart and gut I saw at that panel in '09. The Gearbox team created an expansive and entertaining world. I enjoyed my time working against (and sometimes for) Handsome Jack. He was a far more interesting villain than I'd first understood him to be; one with a real investment in the world we shared, a goal that seemed rooted in the corruption of heroic ideals. Nuanced and calculating, Jack is a villain I will remember for a long time. I'm not done with Pandora. I still have the DLC to play through. Pirate's Booty and Big Game Hunts await me. And hell, I'm only level 37. I'll be happily traversing the wasteland for many more hours. Thanks Gearbox for your dedication to good storytelling.